These rare animals occur only in the Olympic mountains of western Washington State at altitudes between 1700 and 2000 metres. They breed only once every two years, and are declining in numbers. 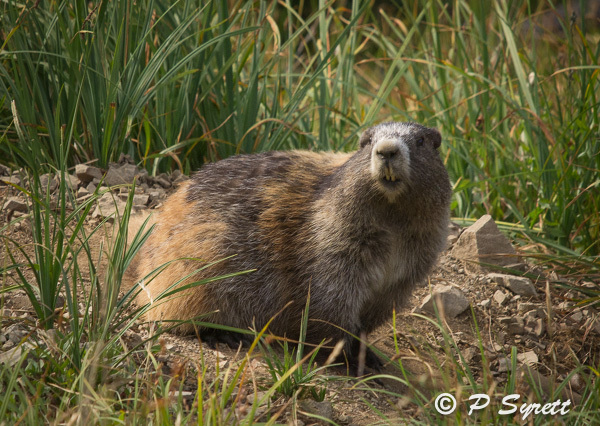 Marmots are not early risers, emerging from their burrows only when it is warm and pleasant outside. 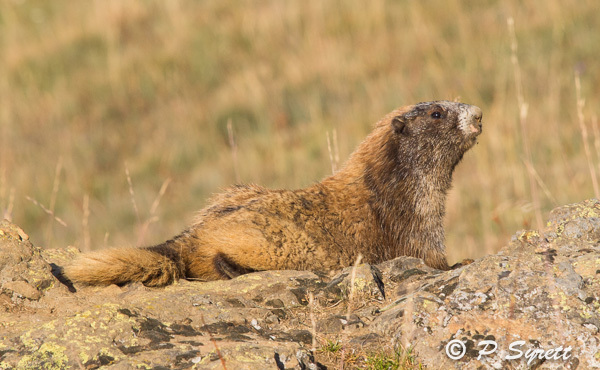 Like other marmots and many squirrels, they hibernate during the winter. 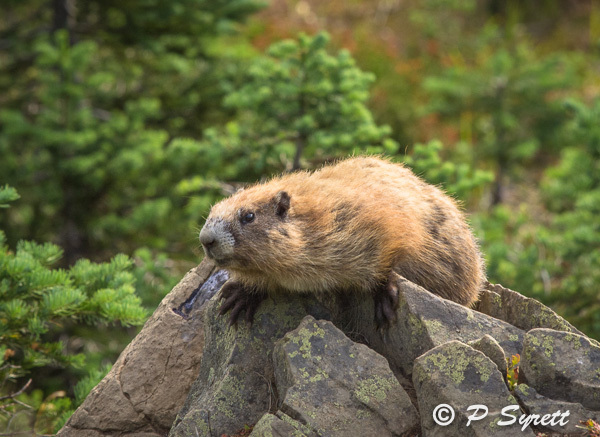 I photographed Olympic marmots in summer 2014 on Hurricane Ridge. It was only on my fourth trek up to to the ridge that I was able to photograph them. On the first visit, I saw marmots in three different locations, but there were lots of visitors around and I couldn’t approach close enough for a photograph without leaving the trail. It is really important not to disturb these animals, and I did not want to encourage other visitors to try to get too close, so we just watched them through binoculars. On the next two occasions it was cold and misty, so no marmots in evidence. 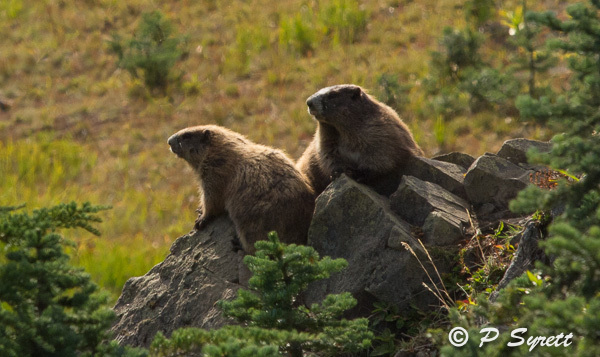 On my fourth visit, fairly early in the morning, when no one else had yet arrived, there were three marmots out at the first spot where we had seen them previously. Conveniently, they were closer to the trail this time. The light was against me, as you can see here, in the image of two of them, but I managed to move round a little and one animal cooperated by perching atop a convenient rock. This image shows the animal’s characteristic black feet. I found another marmot, also on a prominent rock close to its burrow, which was sunning itself and watching the world go by. 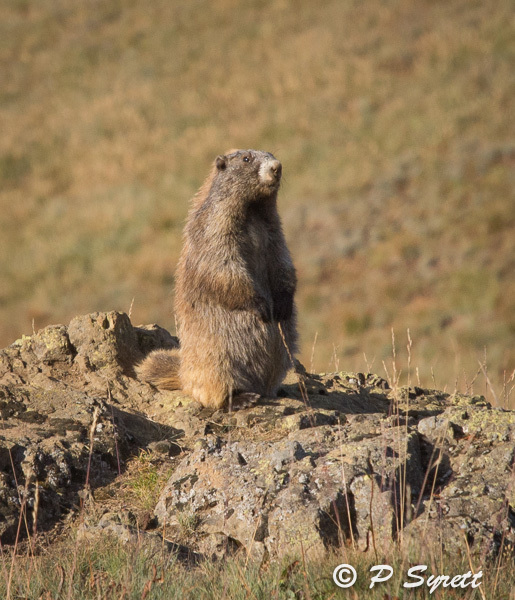 The Olympic National Park is monitoring marmot populations throughout the park, using volunteers under a Citizens Science program, in order to find out why they are declining and hopefully do something about it.